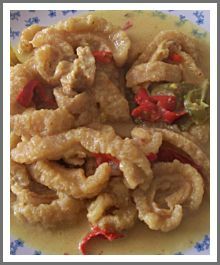 Curried Beef Skin or Kerecek Bumbu Kari in Indonesian is a tasteful Indonesian Recipe. I would say that this beef recipe is not good for your diet. It contains a lot of fat, such as beef skin and coconut milk. It makes the recipe rich of calorie. But if you want to try it, this beef curry recipe is really delicious but it is better to use it as an evening meal than for a lunch. It is really heavy for your stomach. The beef skin krupuk is easy to find in every supermarket. And the other ingredients are also easy to obtain. This means that you can make this curry recipe in just short of time to serve it on the table. Heat the oil in the frying pan and fry the smooth paste, galangal, ginger, kaffir lime leaves and lemon grass stalk until fragrant. Add the thin santan that was used as a marinade. Add the red and green chilies and the Birdseye chilies. Stir the mixture. Add the beef skin krupuk and cook until tender. Add the thick santan and turn the heat to low. Add some salt, sugar and pepper. And remember not too much pepper. And the dish tend to have salty taste than sweet, so don’t add too much sugar and a little bit more salt. Cook until oil comes out of the sauce.